Mughal architectural style developed by the Mughals in 16th,17th and 18th centuries. All the early Mughal rulers except Aurangzeb were great builders. With the coming of the Mughals, Indian architecture was greatly influenced by Persian styles. The mughals constructed excellent mausoleums, mosques, fort, gardens and cities. The Mughal buildings show a uniform pattern both in structure and charcter. It haaaaad a time-span of 132 years, practically from 1526 to 1658, and Agra-Fatehpur sikri, Lahore-Kashmir-Kabul Dehli Allahabad, Ajmir, Ahmadabad, Mandu and Burhanpur are its major centers. Nearly 400 monuments haave survived a time-span of 132 years. White marble and red sand stone was favored. 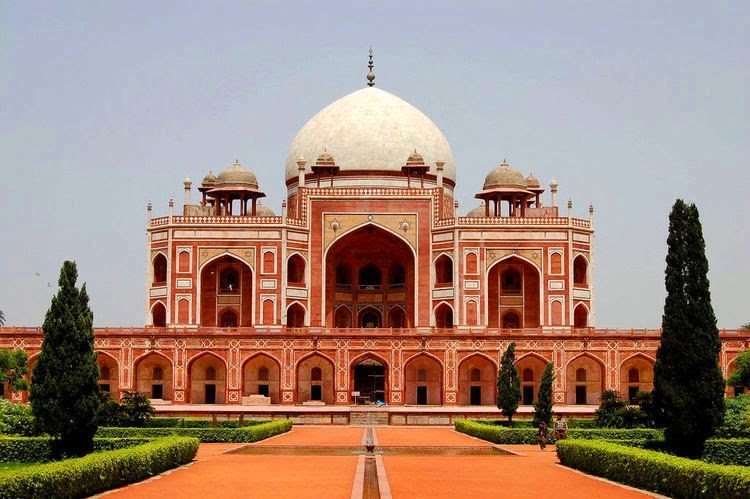 Humayun’s tomb was built by his widow Haji Begum in 1565 A.D. In Dehli in 1569 A.D. fourteen years after his death. The mausoleum stands in the center of a square enclosed garden. The garden is divided and sub-dividded into seqaures, typically of Mughal gardens. The lofty double storeyed structure is built on huge high platform terrace which has a row of calls with arched openings. The central chamber dos octagonal in shape and contains the tomb. Each side of the mausoleum has a large arched alcove in the center with smaller ones on either side. It has a high marble double Dome in the center and pillared kioskd with cupalas surrounding it. 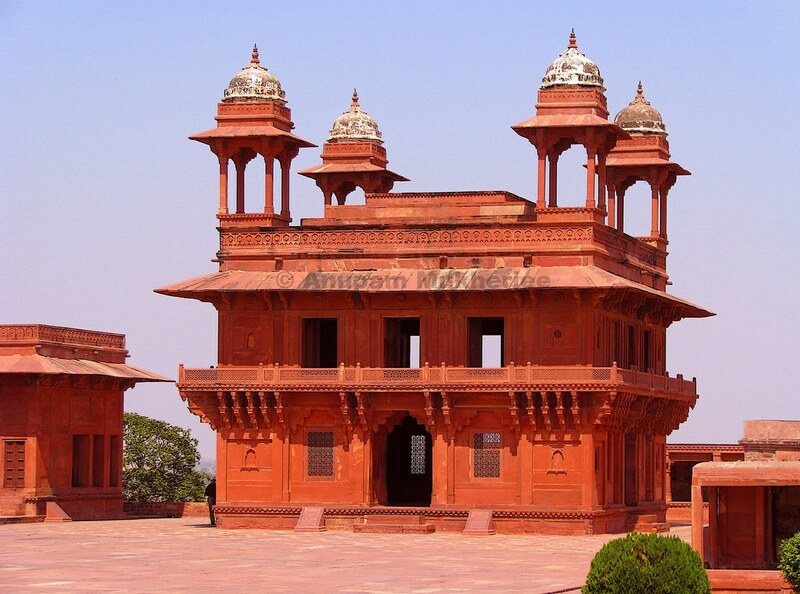 Built of red sandstone with an inlay of black, white and yellow marble it present an imposing picture. Planned by a Persian architect and constructed by Indian workers. A greater part of the fort at agra was constructed by Akber starting in 1565 AD and completed it in 1574 A.D. Situated on the bank of the river jumna, it is a massive and grand structure. The special feature of this fort is the 2.5 kms. Long and 21 metres high circuitous wall of stones are linked with iron rings so close that not even a hair can pass through. The entrance known as Dehli Gate was the ceremonial entrance to the fort. The other smaller gateway is called Hathi pol or Elephant Gate. 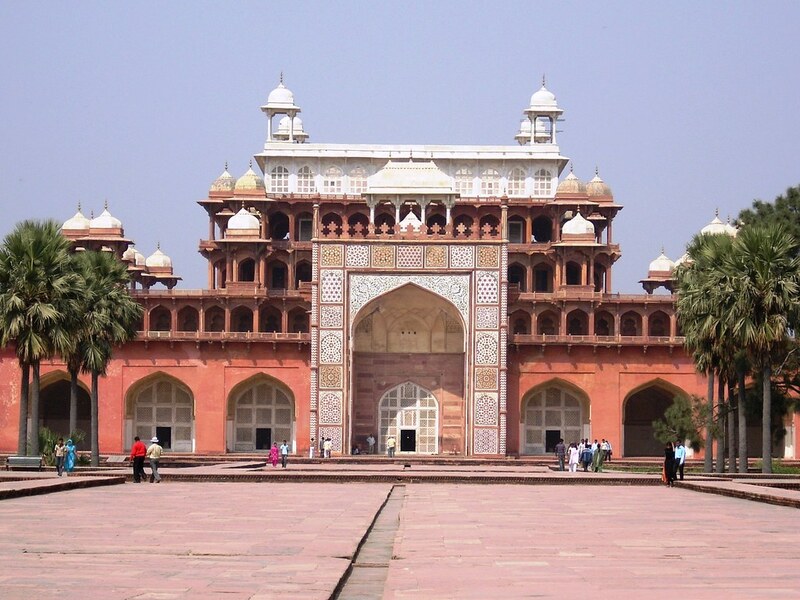 Akbar’s greatest architectural achievement was the construction of Fatehpur Sikri, his Capital city near Agra. The construction of the walled city was started in 1569 A.D. and completed in 1574. A.D. contained some of the most beautiful buildings –both religious and secular which testify to the Emperor’s aim of achieving social, political and religious integration. The religious edifices worth mentioning are the jami masjid and salim chisti’s Tomb. The tomb built in 1571 A.D. in the corner of the mosque compound in square marble chamber with a verandah. The cenotaph has an exquisitely designed lattice screen around. A magnificent gateway was added later in 1571-72 to commemorate his consquest of Gujrat. Built of red sand stone and marble it is said to be the most “most perfect architectural achievement in the whole of india”. A flight of steps lead to the gateway which is about 53 meters in width. Entrance is through a huge arched domed recess. A broad rectangular strip bordering the archway has calligraphic inscriptions on it. At the corners are slender turrets. The beautiful perforated parapet and the row of kiosks with cupalas add to the dignity of the monument. The Mausoleum of Akbar at Sikandra near Agra was started by Akbar and completed by his son Jahangir in 1612 A.D. who changed the original design of his father. Designed on the model of a Buddhist Vihara, it is set in the center of square garden. The enclosure wall on each side has a gateway. The main gateway has four white marble minarets in the four corners. The mausoleum has five terrace, rising from the basement, one above the other, diminishing in size as they ascend. The red sandstone entrance gateway is the largest and is richly decorated with inlaid colored stone work. The mausoleum of itmad-ul-daula, the revenue minister of Jahangir and Noor jehan’a father was built in Agra on the Bank of the jumuna. Started by Jahangir it was completed by Noor jehan in 1628 A.D. A small rectangular structure in white marble, inlaid with semi-precious stones and colored glass, it is a delicate and beautiful piece of architecture. It is the first pure marble monument and differs from the typical massive, red sand-stone structures of earlier Mughals. Situated in a garden amidst fountain, it has a square lower storey with four minarets in the four corners. A traceried pavilion forms the second storey. Some of his outstanding works are the Moti Masjid or pearl mosque in Agra fort and the Taj Mahal, the red fort in Dehli with the Diman-i-Am and Diwan-i-khas. The fortress is in the shape o a rectangle 900 meters by 550 meters. The rampart walls are about 34 meters high. A moat surround the rampart. Two of the five gateways pf the fort are three storeyed structures flanked by octagonal towers. These are the Lahori Gate and Dehli Gate. The main entrance to the fort is through the Lahori Gate. A covered passage with shops on either side leads to the palaces inside the fort. 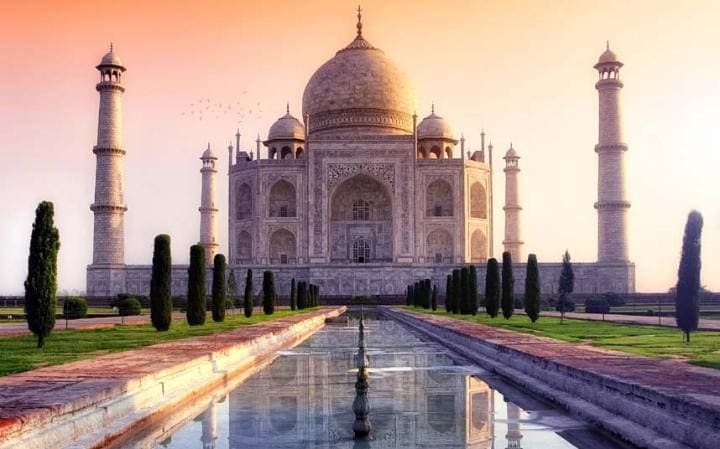 The Taj Mahal in Agra, a dream in white marble was built by Shah Jehan as a memorial to his beloved wife Mumtaz Begum. Built on the bank of the river jumna, it was started in 1632 A.D. and took 22 years to complete. Marble from Makrana and Precious stones from different parts of the world were used in its construction. Planned by Isa, a Persian architect it is a masterpiece of architecture. The taj is is situated in the center of a high marble terrace. The minarets are crowned with Domes. The Mughal period in the Indian history is one of the glorious period that have enriched india in multifarious ways. Art and architecture had received a great fillip during the Mughal period that had gifted us with architectural gems that have defied the passage of time in their appeal and splendor.